Home → Tradeshow & Signage → Tradeshow → Lanyards → Polyester Lanyard with Breakaway Release - 3/4"
Polyester Lanyard with Breakaway Release - 3/4"
Get the word out at your next tradeshow or event with customized lanyards! Hand them out to participants and attendees to take home or incorporate them into event staff uniforms as part of a sponsorship deal to easily identify them while spreading the word about your business. Each polyester lanyard features a breakaway release for safety and your choice of a bulldog clip or swivel clip attachment. Your price includes a one-color step and repeat imprint on the outside of the lanyard. Please call for more information. Who doesn’t love a cheap promotional lanyard for trade shows that doesn’t skimp on quality? Nobody who wants to make a good impression for a low price, that’s for sure. 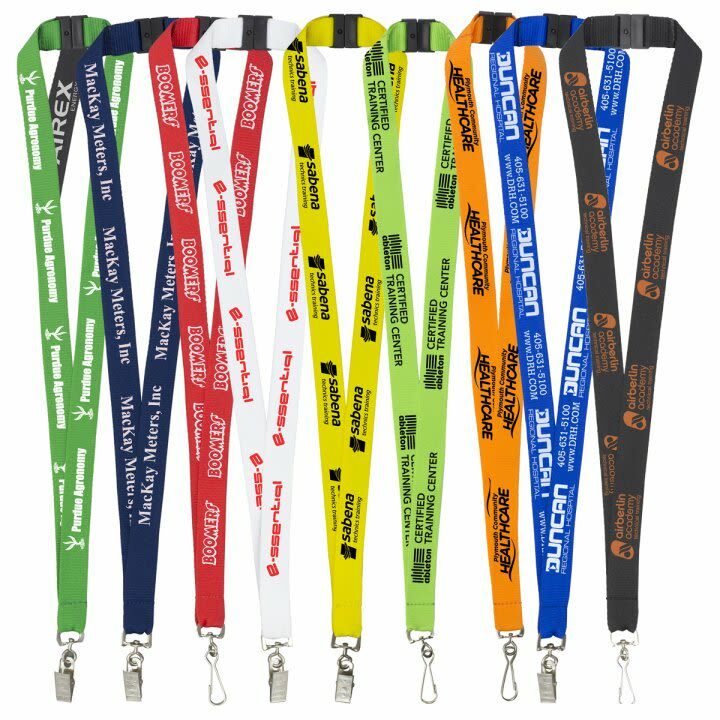 Our ¾ inch wholesale polyester lanyards are highly durable and are useful as trade show giveaway items, cheap promotional products, and everyday use by employees. Each one is 18 inches long by ¾ of an inch wide, with an imprint area of 1⅝ inches wide by ½ of an inch high. If those numbers appear to conflict, our guide for how to measure lanyards will clear it up for you. Don’t worry, it opens in a new tab and you won’t be taken away from this page. These wholesale polyester lanyards feature a step and repeat imprint style. This means that one image is replicated several times throughout the fabric. They come standard with a one color and one sided screen printed design, but 2nd sided imprints are available as an upgrade option. Our ¾” bulk polyester lanyards for trade shows & giveaways come with two different attachment options. You can either go for a bulldog clip or swivel clip. They also contain a breakaway release, which are highly useful whenever the fabric of a lanyard gets tangled or snared. If you’d like something a little smaller, we also carry ⅜” wholesale polyester lanyards.